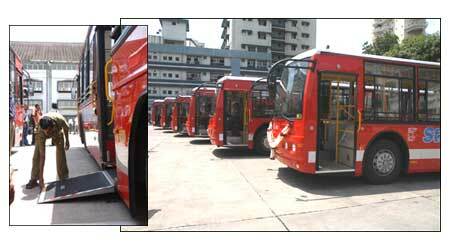 Thousands board BEST (The Brihanmumbai Electric Supply & State Transport) buses to travel the city's length and breadth daily. When it comes to road transport, these bright red vehicles have long been a lifeline. BEST today inaugurated six sophisticated new buses with a number of advanced facilities, and has placed an order for 644 Leyland buses and 30 ultra-low floor buses. The buses will have a reduced floor height of 860mm, as against the normal 1050 mm, for easier boarding, with two-step entry. They also conform to BS III emission standards. And yes, they are more passenger friendly. The front seats will have safety belts for passenger protection during sudden braking. A ramp for wheelchairs, improved ventilation in the driver's cabin, storage space for crutches, and route indicator at the rear are some of the additional features. Add to these a distinct body design and winning colour combination, and commuters have an attractive option to look forward on daily. Now, if only they get around to doing something about those Mumbai roads!